Gifts from donors helped Riley create state-of-the-art private rooms in the new Simon Family Tower. Beginning August 29 through October 8, Walmart and Sam’s Club are asking customers to support kids by making a donation of $1 or more at the retailers’ 138 locations to raise funds for Riley Hospital for Children at IU Health, Indiana’s only Children’s Miracle Network (CMN) Hospital. Every donation stays local to help Riley kids—like Reagan DeLoach of Newburgh, Ind. Reagan is a normal, spunky two-year-old thanks to the care she receives at Riley Hospital. When Reagan was two months old, she was referred to Riley Hospital and diagnosed with sagittal synostosis, a condition where a suture on her skull closed too quickly, causing her head to appear narrow from side to side and lengthened from front to back. Laurie Ackerman, M.D., a Riley Pediatric Neurosurgeon, performed a surgery to correct Reagan’s condition. Now, Reagan is healthy and returns to Riley for annual check-ups. 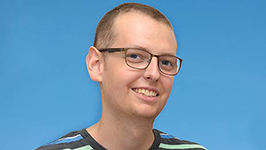 Throughout Reagan’s diagnosis, surgery and recovery, Seth DeLoach, Reagan’s father, relied heavily on the support from his fellow associates at Walmart. This year, the DeLoach family are featured in Walmart stores across the country as a part of Walmart and Sam’s Club’s fundraising efforts for CMN Hospitals. 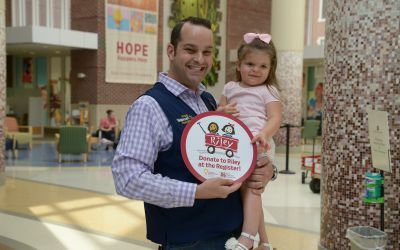 "Riley Hospital for Children provided outstanding care for Reagan DeLoach and her Walmart family, further strengthening the relationship between our organizations,” said Marlene Hunter-Lammie, Walmart Regional General Manager. “For nearly 30 years Walmart has supported CMN hospitals and their mission to serve the children of the same local communities where our associates and customers live. We will proudly continue that support in the years to come." Click here to watch Reagan's story. Since 1987, Walmart and Sam’s Club fundraising across North America has provided more than $750 million for pediatric care. Riley Children’s Foundation supports Riley Hospital for Children at Indiana University Health, Camp Riley and the James Whitcomb Riley Museum Home. As Indiana’s only comprehensive hospital dedicated exclusively to the care of children, Riley Hospital has provided compassionate care, support and comfort to children and their families since 1924. Each year children from all 92 Indiana counties turn to Riley Hospital and its regional clinics throughout the state more than 300,000 times. Riley Hospital’s partnership with Indiana University Health and its strong affiliation with the Indiana University School of Medicine make Riley Hospital the leader in pediatric care in the state and the region. For more information, visit RileyKids.org. Children’s Miracle Network Hospitals® raises funds and awareness for 170 member hospitals that provide 32 million treatments each year to kids across the U.S. and Canada. Donations stay local to fund critical treatments and healthcare services, pediatric medical equipment and charitable care. Since 1983, Children’s Miracle Network Hospitals® has raised more than $5 billion, most of it $1 at a time through the charity's Miracle Balloon icon. Its various fundraising partners and programs support the nonprofit's mission to save and improve the lives of as many children as possible. Find out why children's hospitals need community support, identify your member hospital and learn how you can Put Your Money Where the Miracles Are, at: CMNHospitals.org and facebook.com/CMNHospitals.